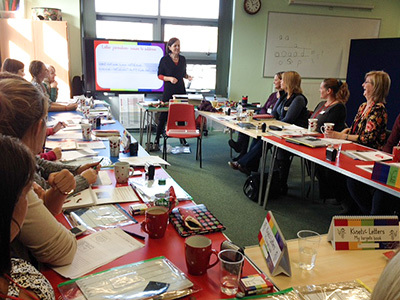 The following training courses equip teachers to use the Kinetic Letters programme by providing information and practical workshop experiences linked to using the Kinetic Letters books and resources. Building physical strength to help concentration and the ability to hold and manoeuvre the writing tool for extended periods of time without tiring. Strategies for learning, self-correcting and maintaining an optimal pencil hold for comfortable, fluent and legible writing. Teaching children to write letters with automaticity and combine letters into words for writing, using developmentally appropriate strategies and resources. Enabling flow in writing from the start. This takes place in the school, about 5 weeks after Kinetic letters has been introduced, in order for informed observations and discussions/advice about ‘next steps’ to take place. Training in teaching pupils to use rhythm and flow in order to write at speed for extended periods of time. Learn how to prepare children for joined writing and teach the 12 week Kinetic Letters Joining Programme. Course content and organisation can be adapted to suit Primary/Secondary schools or Cluster groups. Contact: info@kineticletters.com to discuss requirements. Is very manageable to implement straight after training.